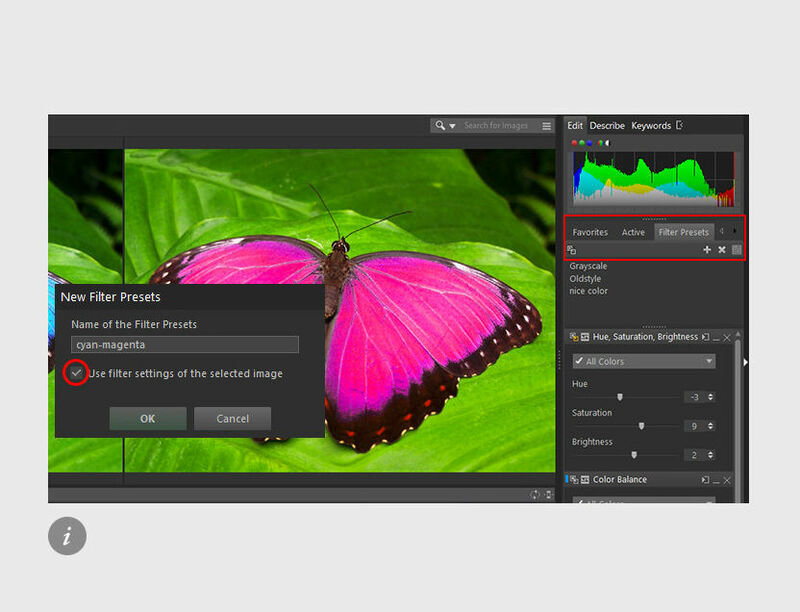 In the image editing tool bar, click the tab «Filter Presets». Click the «+» icon and enter a name for your preset. If the checkbox is checked, any combination of filters and settings applied to the current image will be saved as a preset. If this option is unchecked, you can open tools and choose settings that are not related to any image. the current image. In this sample, the image tool «Hue, Saturation, Brightness» is used to shift the blue and cyan color ranges towards magenta and with «color balance» the overall impression is refined. An effective and efficient image editing process will benefit from the time-saving ability to conveniently store frequently used or particularly creative combinations of image tools and their settings. Advantage: Once set up, these image tool “Presets” are just a mouse-click away any time you need to apply the same creative treatment to other images. There is no limit as to how many image tools combinations can be saved as “presets”. To apply a “preset”, choose its name from the list and then drag the «Copy» button to an image, or a selection of multiple images. Instead of dragging the “Copy” button, you can also just click it to apply it to the currently selected image(s). If some image tools had already previously been used against an image, then the tools and settings from the preset will be added and will take precedence. Saving image tools and settings can boost productivity and offer great flexibility during the creative process. “Presets” can be changed and re-saved, or can be extended with additional tools and settings before being saved as a new “Preset”.